This is a look that composed of a tri-color eye, combining soft purple, grey, and navy, and the color combination is not only flattering for most skin tones, but also wicked on brown eyes. In contrast, the cheeks and lips are a warm coral-peach in tone. 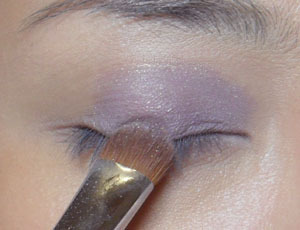 Step 1: Apply the soft purple to the inner 2/3 of the lids. 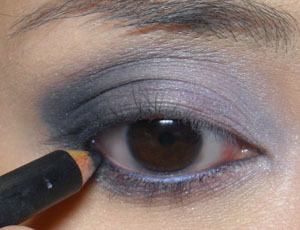 Step 2: Apply a soft grey to the outer half of the lids, blending into the purple. Step 3: With a dark navy, darken the outer corners and up along the socket line slightly. Then trace along the lower lash lines as well. Finish with navy blue liner along the water lines. Step 4: Curl lashes, apply fake lashes, and then mascara on the lower lashes. I used longer lashes than usual today, just to emphasize the smokiness of the look without too much heavy color. Revlon Super Lustrous Lipgloss in Coral Reef in just the center of the lips. Press lips together to spread and even out the color a little.